Apart from the island tourist zone (part of the world’s second-longest coral reef), the Mexican residential section of the city, the downtown part of which is known as “El Centro,” follows a master plan that consists of “supermanzanas” (superblocks), giant trapezoids with a central, open, non-residential area cut in by u-shaped residential streets. These open centers usually have walkways and ‘sidewalks’ around a central garden park, or football fields, or a library, etc. 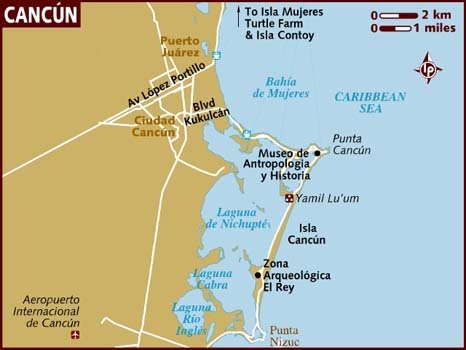 which make the mainland “Mexican” Cancún bicycle-friendly.